Having worked in technical services for a firestopping manufacturer for many years, I have heard just about everything regarding firestopping products and practices. It is amazing how certain fallacies or inaccuracies can develop and spread like wildfire throughout the industry. Let’s dispel some of the myths surrounding firestopping. Firestopping caulks and sealants must be red in color. This is a common misconception. There are no code requirements that specify that a firestop sealant or caulk must be red. In fact, firestopping sealants and caulks come in a variety of colors to differentiate the type of product and its use. For example, many leading firestopping manufacturers color their intumescent sealants red and use other colors for nonintumescents while others make no distinction. Intumescent sealants expand with heat to close off combustible penetrants. Nonintumescent sealants are designed for metallic pipes (noncombustible penetrants) and are nonexpanding. To avoid misapplications, carefully read the label and UL test. Polyurethane foam is an adequate firestop. Don’t assume that any product is a firestop product unless it bears the correct markings from a third-party testing or listing agency. Even then you must be careful that the affixed third-party listing applies to fire resistance. For example, insulation foams in aerosol cans typically bear a label that indicates flame spread and smoke development ratings. This type of listing also applies to paints, wallpapers and certain furnishings. Low-density polymer foams typically ignite very readily and are quickly consumed by fire. This makes them a poor choice as a fire-barrier material unless they have been specifically formulated and appropriately tested for this type of use. All pipe insulations are firestopped the same way. Not true! The fire performance of pipe insulations can vary dramatically. Some noncombustible insulation such as mineral wool actually resists fire and aids in the firestopping process. However, low-density polymer foam insulation, for the same reasons noted above, can be much more challenging to firestop. For this reason, UL Classified systems are material-specific to insulation type, thickness, density and firestopping material. Before selecting an insulation material, make sure suitable firestop systems are available. Sleeves are always required for cabling passing through fire-rated barriers. While sleeves are often used to create openings for cables passing through fire-rated barriers, there is nothing in the codes to specifically require them. The use of sleeves is totally at the discretion of the specifier or installer. Sleeves are often preferred for cabling penetrations because they act as a container for both the cables and the firestopping material. Sleeves and nonhardening firestop putties are a great choice for datacom cable penetrations subject to frequent moves, adds or changes. Whether you elect to use sleeves or not, appropriate UL Classified systems are available for either installation choice. Be sure to choose a design that is appropriate for your selection. One more thing about sleeves: Make sure that they are attached to the barrier. The codes do require this! Cable trays are not approved to pass through fire-rated barriers. This is another fallacy. Again, there is no specific limitation within the codes that would preclude running trays through rated walls so long as they are properly firestopped. And the 2003 UL Fire Resistance Directory Volume II has more than 200 classified through-penetration firestopping systems that are specifically designed for cable trays passing through fire-rated wall assemblies. 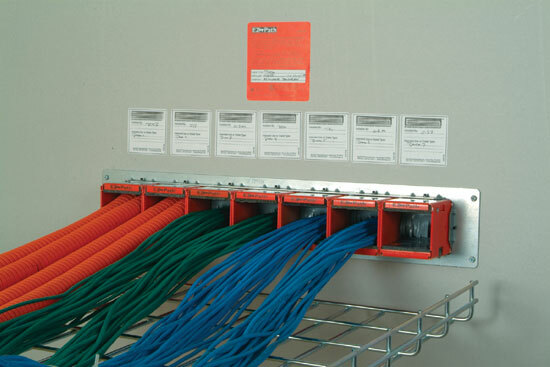 Using UL’s alphanumeric system for firestop systems, be sure to check the 4000 series numbers for cable tray systems that penetrate the barrier. Terminating the trays may make firestopping easier in some types of applications. When this happens, be sure to check 3000 series UL Classified systems to find an appropriate design for cables (only) penetrating the barrier. Wire mesh is required for pillow and cushion-type firestopping systems. This is not always the case. Several of the more prominent firestopping manufacturers have successfully tested their materials to eliminate the need for wire mesh. It is important to consult the individual tested designs to determine whether or not wire mesh is required. In some cases, wire mesh may be desired as a security method to prohibit unauthorized access to the firestopping system. Nonshrink grout is an acceptable firestopping system. 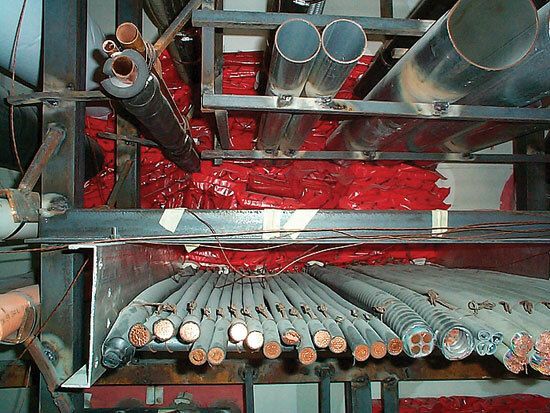 There are no tested systems for nonshrink grout installed in the annular space around cables or steel conduits. Nonshrink grout, not properly tested or evaluated, can crack and spall in the presence of high heat and flames, causing the firestopping system to dislodge. 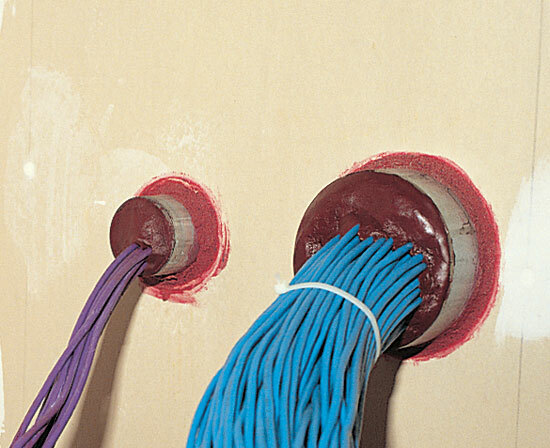 Drywall mud and tape is an approved firestop for cables through gypsum board/stud walls. Drywall mud is not a tested and approved method of firestopping cables passing through gypsum board/steel or wood stud wall assemblies. Drywall mud is approved for covering seams between adjacent layers of gypsum board in fire-rated assemblies. However, it is not a gap or void filler used for the annular space between cables and the periphery of the opening. Furthermore, the brittle nature of drywall mud can cause it to crack or deteriorate over time due to the weight of the cables resting atop it. Most drywalls mud-type products are water-soluble. Thus, moisture can cause such products to dissolve and deteriorate. All listed or classified through-penetration firestop systems have been evaluated for smoke leakage. This is another misconception that is rampant within the firestopping industry. The fact that a firestopping system has been tested to applicable firestopping standards does not mean that it has been evaluated in terms of its ability to impede the passage of cold smoke from compartment to compartment. The fire test standard, Fire Tests of Through Penetration Firestops ANSI/UL 1479, includes an optional air leakage test, which a manufacturer can choose to run on its products to determine the amount of air leakage (in cubic feet per minute per square foot) through the firestopping systems. Such systems include an L rating in addition to the standard F and T ratings shown. If a system does not include an L rating, it has not been evaluated with regard to its ability to block smoke, and installing contractors should proceed with caution as they might not meet the intent of the building code. ASTM E136 is a test method used to evaluate through-penetration firestopping systems. ASTM E136 is never used to evaluate through-penetration firestopping systems. In fact, it is generally used as a reference for sealants formulated from inorganic materials such as stone or mineral powders used for purposes of fireblocking or draftstopping in nonrated, residential single-family homes. Whenever contractors or specifiers see a reference made to ASTM E136, they should proceed with caution and verify that ASTM E814 is also shown on the tube or pail. If ASTM E814 is not listed as a test standard, the product is only approved for nonrated, residential construction. Nonintumescent sealants may be used for insulated pipes and combustible polymer-jacketed cables. Sadly, in some instances this is true. Certain manufacturers have tested nonintumescent (nonexpanding) firestopping sealants for insulated pipes and combustible polymer-jacketed cables. Such systems are heavily dependent upon a number of factors, including thickness of pipe insulation, or the type and size of cable and the amount of cable passing through the opening. In addition, some systems may require the use of noncombustible damming materials or thicker seals. As a general rule, intumescent sealants should be used for materials that will burn away. Intumescent sealants that expand with heat are capable of forming an insulating char that squeezes down tightly on polymer-jacketed cables, minimizing the potential for the cable jacketing to ignite and propagate the fire from compartment to compartment. If the installing contractor is using a nonintumescent sealant, caveat emptor – let the buyer beware! Verify that the sealant is tested and approved for the types and sizes of cables being installed. Firestopping products are rated for a specific hourly duration (e.g., one-hour, two-hour, etc.). Contrary to popular belief, firestopping products are not rated by themselves. Firestopping products are installed in a particular manner to attain a specific hourly rating, but that rating is dependent upon the performance of the fire-rated barrier as well as the penetrating item (e.g., cable, pipe, conduit, etc.). Firestopping products are installed as systems. Only a system carries a rating, not an individual product. One way to separate facts from myths is to become more informed on firestopping. A great source of information is Underwriters Laboratories’ annual Fire Resistance Directory, Volume II, or its online certifications directory at www.ul.com/database. Both the book and the website contain up-to-date information on tested and classified systems for through-penetration firestopping. In addition, most of the more credible firestopping manufacturers offer training classes on firestopping products and systems. Contact a firestopping manufacturer to arrange for a consultation and training class for your installers. Remember, firestopping is more than simply installing sealant in a hole. Firestopping is a critical component of a building’s overall life-safety system. A properly installed firestopping system protects property, but more importantly, saves lives by inhibiting the spread of fire from compartment to compartment and buying valuable time for occupants to exit the structure in the event of a catastrophic fire. Sleeves and non-hardening firestop putties are a great choice for datacom cable penetrations subject to frequent moves, adds or changes. Codes require that the sleeves be attached to the barriers. Firestopping cable pathway devices can be ganged together to increase cable loading and/or help organize cabling types going through the same area in a wall. These cable pathways present a neat appearance as well as organize the multiple electrical and datacom cabling required for today’s buildings. Re-enterable products such as firestop pillows conform easily to the contours of the piping system.